TORONTO, Mar. 25 /CSRwire/ - The Global SDG Awards is pleased to announce the winners of its inaugural competition. The Awards are designed to celebrate private-sector leadership in the advancement of United Nations 2030 Agenda, also known as Sustainable Development Goals (SDGs). The winners from this year’s competition are breaking barriers, challenging convention, investing for impact and leveraging new technologies to strengthen their competitive advantages. 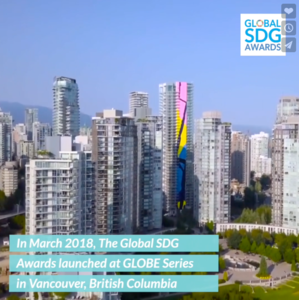 With winners from Australia, Afghanistan, Canada, Japan, South Africa, the UK and USA, the results of the 2018 Global SDG Awards demonstrate that private-sector SDG leadership, investment and innovation is truly a global phenomenon. “I can confidently say that each of the 2018 Global SDG Award Winners is an example of next-generation sustainability leadership” said David A. Klar, Founder & Executive Director of The Global SDG Awards. “Companies that seamlessly integrate profit and purpose – while leveraging new technologies to achieve scalability at lower costs – will be uniquely positioned for growth over the coming decades”. More than 65 companies from around the world responded to The Global SDG Awards’ inaugural Call for Submissions by using an online application form to provide a range of SDG indicators, financial metrics, expansion plans and qualitative examples of positive stakeholder impacts. The Awards’ application questions and evaluation methodology were peer-reviewed by the Delphi Group – a leading Canadian sustainability strategy & consulting firm. The corporate submissions were evaluated by an international panel of over 70 judges representing expertise from 17 countries and across 5 continents. The 2018 Global SDG Award Winners will receive custom-designed trophies manufactured by Rivanna Natural Designs Inc., a B Corporation from Richmond, Virginia (USA) that specializes in planet-friendly awards, plaques and corporate gifts. The 2018 Trophies are made from FSC-certified recycled materials, and carbon credits have been used to offset energy-related emissions. “We are honoured to win the 2018 Global SDG Award for Clean and Affordable Energy and to have our innovative off-grid home solar solutions in the global spotlight. In addition to delivering affordable renewable, clean energy to light homes, Azuri’s solar technology is enabling rural Africans to access modern services and prosper from the economic benefits associated with energy access” – Simon Bransfield-Garth, CEO, Azuri Technologies Inc.
“EPAM started its work with eKids four years ago, which leverages our knowledge and technical expertise to educate the next generation of technologists. We are fortunate to have the opportunity to work with children around the world and share our passion for technology” – Larry Solomon, SVP & Chief People Officer, EPAM Systems, Inc. Founded in 2018, The Global SDG Awards is a not-for-profit organization that rewards businesses that are inspiring and influencing meaningful systems-level change. The Global SDG Awards is an international sustainability initiative designed to increase private-sector engagement with the SDGs framework through competition. The awards shine a spotlight on what’s possible with respect to private-sector solutions that create a better future. Applicants can compete in each of the 17 SDG categories, demonstrating leadership in collaboration and innovation as they work toward a common goal of creating a better future.